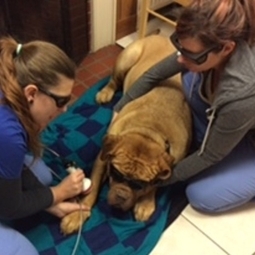 Laser therapy - Veterinary Medical Ctr of Lebanon, Inc.
Laser therapy is a non-medicinal way to ease your pets inflammation or pain. We offer this service mainly for post surgical pain or chronic arthritis, although there are many other uses. A laser light is placed over the area of inflammation/pain to work at the cellular level to decrease the inflammation/pain. Special sunglasses for humans and doggles for pets are worn during the sessions which last 5 - 30 minutes depending on how many areas are lasered. The laser can be used in addition to many medications. In our photo to the left we have Cat (certified technician) performing laser therapy on the front leg of Apollo while Laura (veterinary assistant) comforts him during his treatment.